The reliable, long-lasting, industry standard air pump that homeowners count on to keep their aerobic treatment system up and running. Linear air pumps with outstanding service life for treatment system designers, manufacturers, and Service Providers. Vacuum and pressure air pumps that are oil and lubrication free, power efficient, and extremely quiet. Durable, oil-free linear pumps designed for continuous use with cathode air, hydrogen recirculation, and gas booster applications. A wide variety of both pressure and vacuum pumps for myriad industrial applications. Dependable, power efficient, and designed for continuous use. Quiet and dependable air pumps designed for continuous use, so there’s never a worry about your fish, or aquatic life not having the proper aerated environment. 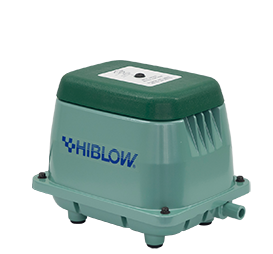 HIBLOW USA is the North American sales and distribution subsidiary of Techno Takatsuki, LLC. With manufacturing facilities, engineering teams, and sales offices spread across the globe—we are equipped to provide pneumatic solutions worldwide. HIBLOW USA offers support for application engineering, custom products, and inventory management. If you have a project outside of North, or Central America, we will connect you with our partner offices covering your geographic region.